Lazy days with nothing to do - this is what summertime is supposed to mean. Many of us remember our childhood summers like this. No schedules, no school, no schlepping to and from different events and commitments. 1. Have a lemonade stand. This can be as elaborate as building a wooden store for your little one to sell the refreshing summertime beverage or this can be as simple as sitting on your front stoop with a tall Thermos and a stack of tiny Dixie cups for your baby's stuffed animals. You will stay hydrated to care for your baby, and your little one will enjoy the time outdoors. 2. Make things move. Babies and children love to throw things they shouldn't throw, so how about showing them places where throwing is allowed and safe? Toss bean bags in the yard, skip rocks in the water, and blow bubbles at the bus stop. Each of these will bring your baby outside and help you get out into the summer sunshine. 3. Melt toys. Next time when you are prepping your freezer stash of pumped milk, put some of your baby's toys, cars, or play pieces in a shallow tray of water and place it in the freezer so the toy is frozen inside the cube or block of ice. On a hot day, place the iced toy outside and have your baby see and feel the ice melting. She will be amazed as the toy magically appears while she is cooled off by the melting ice. 4. See other babies being nursed. Visiting petting zoos or farms on "Baby Animal Days" in early summer often allows your family wonderful opportunities to see nature's mommas nursing their babies. I remember visiting a local farm when my older boys were still in a double stroller and we saw a mother pig nursing her piglets. I wasn't sure how they'd react to seeing this, but I was pleasantly surprised when my oldest said, "Wow, she has sooo many babies to feed. Mommy, you're lucky you only have to feed one baby." 5. Take an imaginary vacation. If you live near an airport, chances are you live in a regular flight pattern and frequently see jets flying overhead. Sit with your child on a blanket looking up at the sky, point to the airplane and ask him or her where they think the plane is headed. Ask open-ended questions such as who is on the plane, where will they land, who will they visit, what will they do while they're on vacation, and what would you do on your vacation? 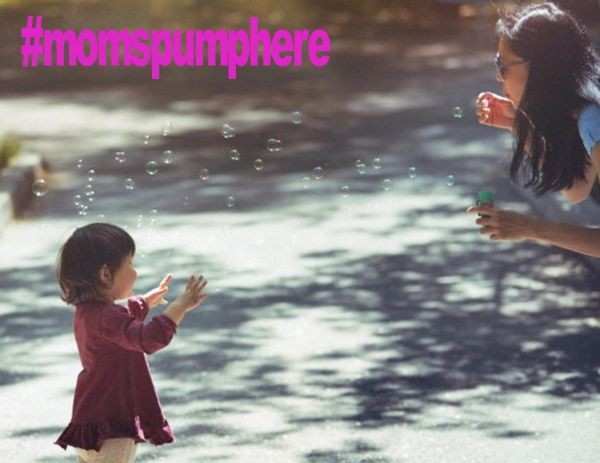 This may inspire you to plan a trip of your own - and you can use #momspumphere to help you plan your places to pump. We moms know that the simpler moments are the better moments, and right now they seem like they are all very small. But seeing how fast our babies grow up reminds us that these simple, small moments are really the big moments that we should cherish.